Backyard Pool With No Diving Board? 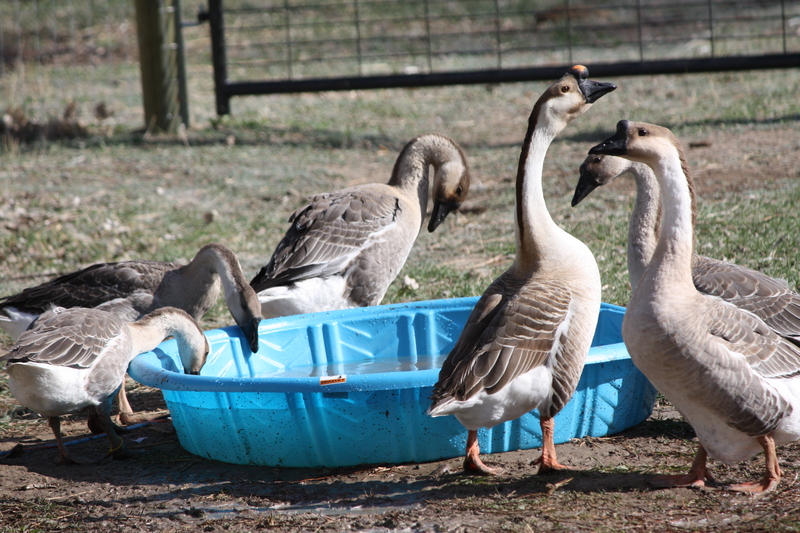 Geese are water birds, and the excitement that a new wading pool created was almost overwhelming. Fred, paterfamilias and His Excellence the Great Gander, immediately decided to lord it over Ethel and the four goslings. While they raced around the edge of the pool in a very agitated state, Fred splashed around in the center of the pool thoroughly enjoying his good fortune. Then Ricky, the largest of the goslings, decided to jump in and join in the fun. The squawking, thumping and pecking that ensued should have been captured on videotape (why didn’t I think of that?) . . . the eventual outcome of all the splashing was a draw, as Ricky vacated the pool in deference to Fred’s status as Great Gander. But it was a clear indication that Fred’s status will be challenged in the days and weeks to come and I’m laying my bets on Ricky to reign supreme.
. . . I'm first in the pecking order, and that goes for a bath! The big guy, front and center, with the red knob on his head.